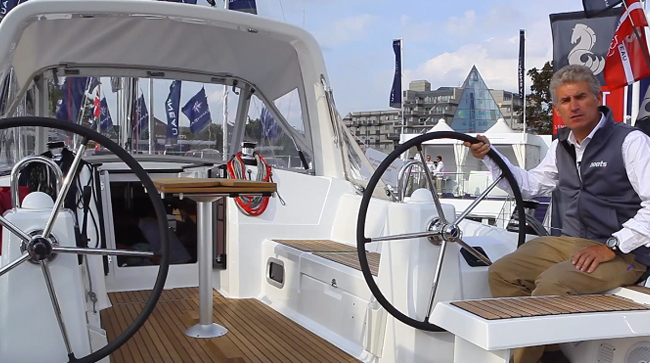 Join us for a sail and a close examination of the 2015 Beneteau Oceanis 60. No moss grows under a Beneteau keel, and just two years after launching the Oceanis 55—then the flagship of the Oceanis line—the company has introduced the newer, bigger Oceanis 60. This prolific French boat builder keeps introducing new models to make sure their line is constantly refreshed, and although the 60 is based on a previous model, I found there’s much to discover about this rejuvenated version. The Oceanis 60 is actually a stretched version of an older Beneteau 58 hull, with some interesting improvements. The new boat is largely defined by two features in the added aft section: a dinghy garage that’s accessible when the transom drops down to form a swim platform, and the additional lounge space on deck behind each of the twin wheels. The garage is handy for stowing fenders, buckets, a shore power cord, and even a small dinghy (Beneteau recommends the Highfield 2.4 meter), though it will have to be partially deflated to fit. Up on deck, optional cushions fit behind the helm seats to form sunpads, which hold two people each. It’s a nice use of the deck extension and makes a comfortable place to sit when under sail or at anchor with the transom down. The outboard lockers that form the backrests of the sunpads are put to use as well, with a propane locker to port and liferaft stowage to starboard. 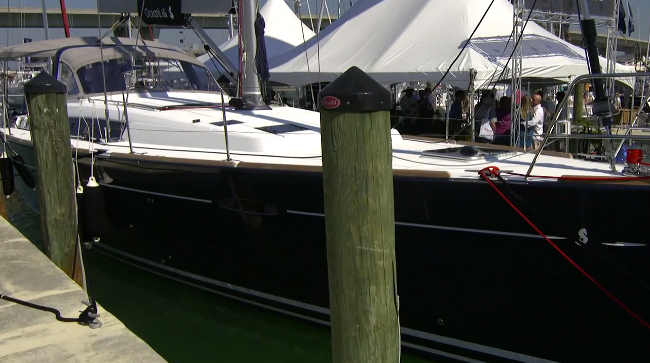 You can get a good look at the cockpit, garage, and helm area in our Beneteau Oceanis 60 First Look Sailboat Video. Each helm seat is also built for two, and has good handholds inboard which come in handy because the wheels are far apart. There’s not much else to hold onto, especially when heeling on a boat with nearly 17 feet of beam. Harken primary winches are within easy reach of the helmsman on either side and the two halyard winches are nearby, but a singlehander could not attend to the lines that lead to these additional winches without the use of the autopilot. Sheetboxes port and starboard ahead of the binnacles are a nice addition, but they seem a bit small to hold the lengthy halyards and reefing lines. The rest of the cockpit is the same as on the older model, with an enormous table between two settees that will easily seat six for an al fresco dinner. The table has an integrated rail that forms a handhold all around and the settee seatbacks have rails as well, which will be handy when walking forward from the wheels to the arch. 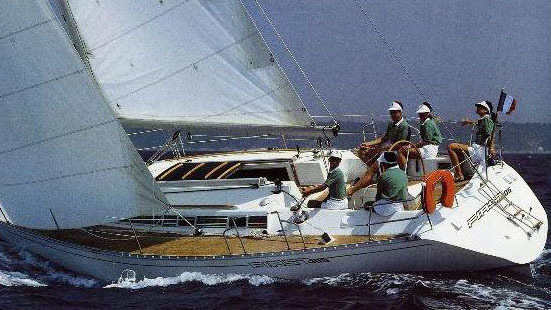 For years now, Beneteau has kept the mainsheet attach point up on a cockpit arch, eschewing a traveler. Although racers may criticize this for a lack of mainsail fine-tuning ability, I believe that most cruisers never touch their travelers and this simple system, kept nicely out of the cockpit, makes complete sense—and has the added benefit of end-boom sheeting for better leverage. Besides, this arch forms the perfect attachment point for a dodger, as well as a launching pad for an entire Bimini top. Moving along the side decks is easy because they’re wide and uncluttered all the way to the bow, where an integrated sprit has room for a single bow roller. Just behind it is the Lewmar vertical windlass. One thing I always notice is the size and placement of deck cleats. The Oceanis 60 has oversized cleats with two amidship on either side, and that’s handy for tying the boat up in variously sized slips. Another hot-button is the height of the lifelines and I’m happy to report that the Oceanis 60 has high stanchions, so the lifelines will actually add to a boater’s safety rather then serving as low trip-wires. The Oceanis 60’s keel-stepped triple-spreader Selden mast supports over 2000 square feet of combined sail area. 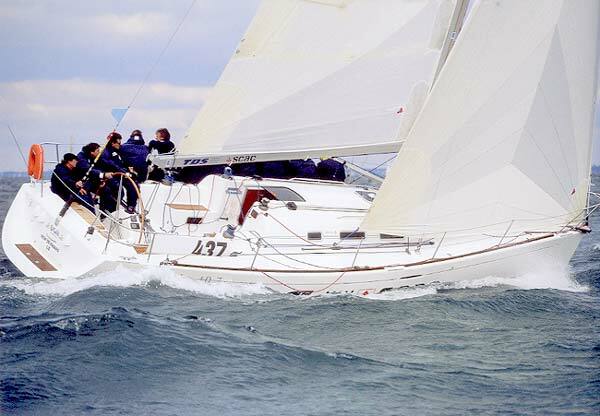 The model comes standard with a 120% genoa on a Facnor roller furling but may be fitted with a self-tacking 90% jib for windward sailing, and a Code 0 on a furler for fast and easy downwind progress. That really would be the best of both worlds, especially if cruising with just a crew of two. Our test boat had a roller furling mainsail which made it easy to reef when the wind piped up. 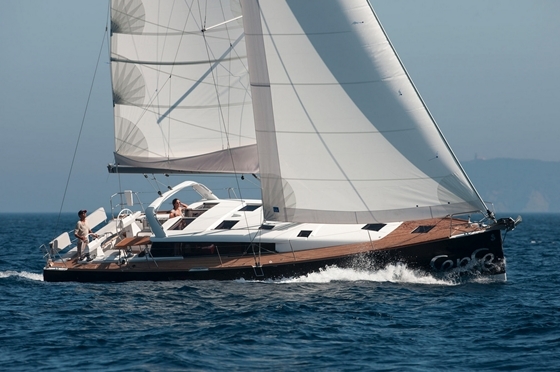 The Oceanis 60 is a luxury yacht and Beneteau doesn’t skimp on anything below, be it layout, amenities, or finish. The saloon is full beam and therefore feels enormous. To port is a straight settee, behind which is an electrically-powered bar cabinet with bottles that emerges to impress while entertaining. If that doesn’t make enough of an impact try the blinds, which also operate electrically. Just aft is the galley with a top-loading freezer, a refridgerator with a side door, an optional dishwasher, a three-burner stove, and a small microwave oven. To starboard is a U-shaped dinette that will seat eight and has an extended lounge on the aft end like a sofa at home. The oft-omitted nav station is a welcome find. The forward-facing nav station across from the galley is a thing of beauty, and one I much appreciate in a world where charplotters have all but done away with dedicated desks. The desktop is large enough to accommodate a chart kit or a folded chart and there are three divided compartments inside: one for a laptop and two others for small handheld electronics, pens, compasses, etc. Who doesn’t miss a good junk drawer when aboard? Behind the nav station is cabinetry that holds two drawer freezers with a washer/dryer combination unit below. This is an excellent use of the space just ahead of one of the aft heads. Two aft cabins with two heads are a standard configuration for the after end of the vessel, and in fact are the only layout that’s offered. The master stateroom is forward but its placement gives it plenty of beam so it feels very roomy. This arrangement also creates room for a crew cabin in the bow, accessible via the foredeck and laid out with over/under bunks, a sink, and a toilet. If there’s no professional crew and no teenager begging for his or her own room, this space will most likely house fenders and docklines. The centerline berth in the master is queen-sized and has two hatches overhead for lots of light and air. To port in the master there's a small vanity desk (and another small hatch) and to starboard is the enclosed head and shower with its own small overhead hatch. Below the cabin sole, there’s a wine rack. Overall, this cabin is so spacious that it has the feel of a luxury hotel room—and in the four cabin charter version, is actually split into two small cabins with ensuite heads. There’s a choice of three Alpi wood stains in satin or high gloss finish and multiple fabrics in a selection of colors. Natural light is plentiful given the long fixed hull and deck ports, as well as the cluster of three hatches just aft of the mast and three more overhead windows by the companionway. From the five steps of the companionway, there are handholds on the sides of the galley and nav desk cabinetry and then again on the overhead from the galley to the forward stateroom door, assuring that moving around in a seaway is safe and easy (although it helps to be tall to reach those overhead rails). Our sailing test began by motoring away from the dock at the Royal Club Nautico de Plama in Mallorca, Spain. The 140 HP Volkswagen diesel pushed the boat easily through a one-foot chop, and in the U.S. this engine is upgraded to a 150 HP Volvo D3 to meet EPA standards. The engine sits below the companionway and has access panels (which could be a bit bigger) from the aft cabins. We moved along at 7.5 knots and topped out at 9.4 knots at 3300 rpm. Standard tankage includes 127 gallons of fuel and 190 gallons of fresh water, with the option to increase to 157 gallons of fuel and 275 gallons of water. This will extend the cruising range by a few nautical miles as well as additional days of comfortable living aboard. We unfurled the big mainsail and genoa and the Oceanis immediately settled into a comfortable 8.6 knots at 70 degrees apparent wind angle, in about 14 knots of true wind. That’s not bad for a boat that displaces nearly 50,000 pounds. Transitioning from motoring to sailing couldn’t have been easier, as if the boat was just waiting to take over and go for a romp. As she settled in, we actually came up to 9.2 knots. Eight point six knots at 70 degrees apparent wind angle, in about 14 knots of true wind? That's quite respectable, for a sailboat of this size and nature. When it came his turn, one of our testers immediately took her up to 34 degrees apparent wind in the false belief that the more the heeling angle the more enjoyable and faster the sail. Although our speed dropped to 7.5 knots, the Oceanis 60 kept humming along even that close to the wind. However, another journalist on the bow wasn’t quite ready for that move and soon found himself braced against the gunnels with water rushing over his ankles as the boat put her shoulder down and dug in. He tried to look comfortable even as his eyes told a different story. I don’t like to sail a boat on its ear, but it’s good to know that the Oceanis can do it, if necessary. Sail Area 2,202 sq. ft.
Beneteau offers packages of options to trick-out the boat, including a three-blade Flexofold propeller, B&G AIS, a pop-up TV in the saloon and a bulkhead-mounted flatscreen in the master, a 9.5 kW genset, air conditioning, an icemaker, a bowthruster, and more. The base price is $675,500 (at the time of this publication) and a well-equipped model starts in the low $900,000 range. Benetau built has built around 90 of these hulls, six of which are the new extended Oceanis 60 version. It was a smart way to leverage a successful hull while also introducing a newish model that refreshes the design and rejuvenates the way the yacht is used. I must admit I was initially unsure of what two extra feet could add, but now realize that there’s definitely room in the market for the Oceanis 60, a large, fun boat which has a yacht-like feel. 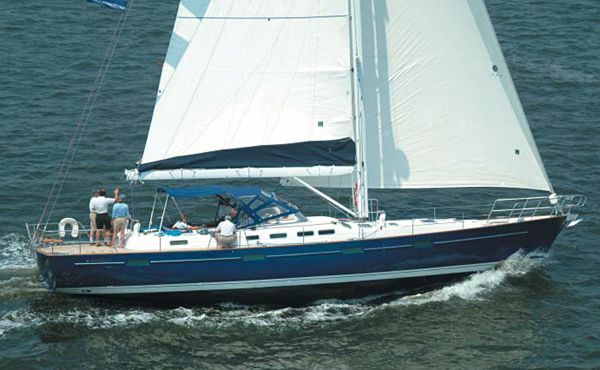 Other Choices: Another sailboat that feels more like a yacht than a boat is the Hanse 575. A slightly larger option would be the Oyster 625. For more information visit Beneteau. 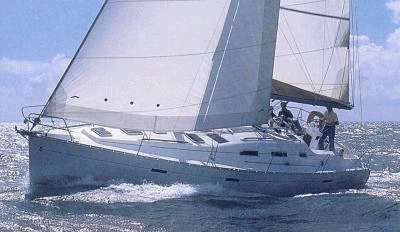 See Beneteau Oceanis 60 listings.